I would really love to travel to some places but my time and budget is limited. Currently, my priorities are not with pleasure since my hubby and I are just starting our family together. Going to different places is a good pleasure that requires a person to invest money and time but in return you’ll have a good experience and favors. Lucky are those who work to different places that they have the advantage of exploring the other side of the world. Nowadays, traveling to other places is not that expensive with the seat sale promo being offered by the travel and tours company. My travel plan this year is to go to a province here in the Philippines that I haven’t reach before like in Visayas or in Northernmost part of Luzon. I would love to be a tourist first here in my own country before going abroad. Because of that I subscribe to Philippinesâ€™ largest national flag carrier, Cebu Pacific email updates. Today I receive latest travel updates and promo, seat sale to six international cities and two domestic hubs with fares as low as P499. That is really cheap but the offer is now April 13 or until seats last. The seat sale provides a lot of destination options for the months of June to August like Lite Fare of only P999 and you get to travel from Clark to Singapore, Hong Kong and Macau, as well as from Manila to Kota Kinabalu and Taipei. 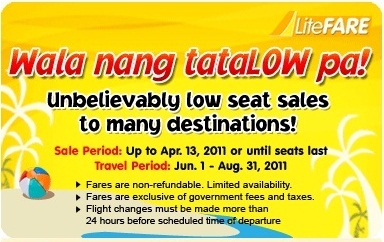 For more details and to avail of their promo kindly visit their website at http://www.cebupacificair.com/. This entry was posted in Promos & Sale and tagged cebu pacific promo 2011, Cebu pacific seat sale, cheap fare promo, international low fare promo, international promo, low fare promo, seat sale promo. Bookmark the permalink. this would make me want to travel more. however, like you i am also prioritizing my family needs. i guess when you already have a family, travelling would sometimes be the least of your priorities. It had been a while since I visited web site with such high quality information. Thansk rather a lot for the useful info. I find your blog on google and read a some of your other posts. I just added you to my Google News Reader. Keep up the good work Look forward to reading more from you in the future. Don’t worry! You still have a lot of time and energy to explore Philippines and other Asian destinations. Just relax and concentrate with your family and things will come in due time.